The Punjabi novel, it is generally agreed, is a fragile species especially in the Western Punjab. It is often assumed it may soon go extinct on this side of the border. The reasons are many; one being that despite its status as the mother tongue of millions, it is a language without any official status accorded to it by the state. The other big reason is the absence of a modern literary culture where people get to discuss novels. In an old Irish folk tale, a questioner asks Finn McCool: “Tell us Finn, what is the best music in the world?” After a long pause, Finn replies: “The music of what happens”. The man, who composed, analysed and amplified not only the music of what happens but the music of what might happen died on August 30 in Dublin at the age of 74. 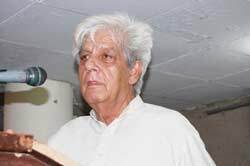 Ahmad Hamesh breathed his last in Karachi a few days ago at the age of 73. His death is being mourned widely in the literary circles as he was witness to an era in which many new literary movements were born. He actively participated in these movements and made more foes than friends due to his staunch views. A few novels — good or bad — which do get written against all odds fall through the cracks as no one hears of or reads them; they are neither appreciated nor critiqued. They simply disappear along with the writers. Khalid Toor and his novels are but one such example to come to light in the world of Urdu fiction. 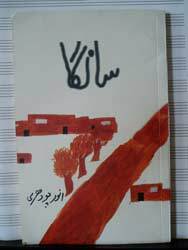 Anwar Chaudheri’s slim Punjabi novel ‘Saanga’is another example which was originally published in 2000. This remarkable little book should be read as widely as possible both for its literary merit and political importance. It remains the only novel, to my knowledge, that charts the rise and fall of Pakistan People’s Party. Since the PPP has finally been defeated, even if we make some room for vote rigging, it is perhaps doubly important for those who care about the party to read the novel to understand what went wrong and how the party’s true promise to the poor masses remained unfulfilled. As the recent pro-Morsi clashes with the Army and the huge loss of life shows that public can be mobilised, the question remains why was the establishment able to kill a popular leader without any real opposition in the streets of Pakistan. If the chief justice of Pakistan could stir masses to action, why couldn’t Bhutto? Where was the disconnect and how was it created? The novel makes an attempt at understanding that bitter and shameful chapter of Pakistan’s history. Saanga’s central character is a mutt, named Dabbu, born out of the mating of a high breed of the dog and a mongrel mother. Since a very early age, he is attached with a family of poor peasants who are forced off the land they had tilled for generations. The PPP is referred to as the Poor People’s Party; whose formation has awakened the disenfranchised throughout the country. The peasants and labourers are becoming aware of their rights, both social and economic. The feudal class is retaliating. There is class tension. The family that has adopted Dabbu the dog is headed by Husaino, displaced along with his wife, sons Peeru and Meeru, a daughter, a daughter in law and grandchildren. After several stages of displacement, the family manages a roof over their head in the outskirts of Lahore, but by then the political upheaval has dealt Husaino’s family a tragic hand and no one is left unscathed. Dabbu the dog is witness to the class clash, rising hopes for better life for the poor and the betrayal of the promise, the murder of Bhutto, and the dark ages and reign of terror initiated by General Zia. Anwar Chaudheri makes us see the changing world through a handful of major and minor characters but creates a counter-narrative that reaches the reader through Dabbu’s reflection. It is through the Dog’s consciousness that the reader is able to empathise with Husaino’s wife Amma Subaan, her fears and concerns. The novel also brilliantly highlights the homo-social nature of the political culture inhabited by the progressives and the leftists during Bhutto’s tenure as the men failed to invite women to participate in the struggle for political and social change. In the discussions of the many characters, Anwar Chaudheri introduces to the reader via Meeru the younger son who has become a low-level political worker of the party; the women only exist on the margins and mostly as shadows. But to compensate and to give women the agency they deserve, he empowers Meeru’s sister-in-law Zaini and his sister Mariaan, who in some ways is a post-modern Heer. As we see the activist’s world in Lahore through Meeru’s eyes, again Dabbu is used as a counter-narrative since he becomes the dog of the entire city. He roams all day and only returns to Husaino’s abode to rest at night. It is through Dabbu’s eyes that the reader sees the male characters falling apart as Bhutto is toppled, hanged and political activists are sent to the Fort or whipped publicly. The finest moment of the novel, in my personal view, appears towards the end. The political forces of the country are making an attempt at challenging the US-backed military dictatorship. Political leaders and party activists are protesting and shouting anti-government slogans without resisting arrest. There is police and army everywhere trying to quell the unrest. Into this mayhem wanders Dabbu who has already showed distaste for the men in khaki. As Dabbu avoids the avalanche of the police boots, he finds himself face to face with army personnel. In the scuffle, Dabbu digs his canines into the flesh of the army man. This is too daring. This is poetic revenge. Dabbu is the consciousness of the oppressed and is closest to authorial intervention. Dabbu feels in his guts that the army is the major reason why Pakistan is in such a sorry state. The novel should be taught to students in high school as an attempt to make them politically aware through fiction. Seamus the famous as he was known among his friends was the greatest poet Ireland has produced since WB Yeats. He was so famous that Dublin literary circles used to joke that Heaney doesn’t have a postman but a postvan for the delivery of his posts. He was a master poet, a Nobel laureate and the unrooted son of Bellaghy. Heaney was born at a Mossbawn farm in Bellaghy, Co Derry (Northern Ireland) on April 13, 1939, the eldest of the nine children of “an ever growing family” as stated in his Nobel lecture. He attended St. Columb’s College in the city of Derry; the move which he would describe as “from the earth of farm labour to the heaven of education”. In 1957, he joined the Queen’s University, Belfast and later taught at the same campus embarking on a lifelong academic career which included Professorship of Poetry both at the Harvard and the Oxford. Although he accepted that Nobel Prize is a life-changing event, he was never affected by that status like his close friends and fellow Nobel laureates Josephy Brodsky and Derek Walcott. Replying to a question just after the Nobel announcement, he responded: “This is the way I have lived since I began to write since last thirty years so my writing plans haven’t changed, my circumstances have changed with so many interviews.” He was awarded the Commandeur de L’Ordre des Arts et Lettres (Commander of the Order of Arts and Letters) from the French ministry of culture in 1996. His other accomplishments include: Golden Wreath of Poetry (2001), TS Eliot Prize (2006) and two Whitbread prizes (1996 and 1999). He won honours from Trinity College Dublin in 2012 when it named one of Ireland’s most prestigious academic appointments after him — the Heaney Professorship in Irish Writing at Trinity College Dublin. Heaney had twelve collection of poems to his credit these include ‘Death of A Naturalist’, ‘Door Into The Dark’. ‘Wintering Out’, ‘North, Fieldwork’, ’Station Island’, ‘The Haw Lantern’, ‘Seeing Things’,’ The Spirit Level’, ‘Electric Light’, ‘District and Circle’ and ‘Human Chain’. I met him last year at the Dalkey Book festival where he had a poetry reading session. This was one of his last public appearances. It was a full house and he mesmerised the audience with his delivery and his poetry in his so loving native Northern accent. He looked tired and fatigued. Among the attendees was Bono the U2 singer who regarded Heaney as “a great, great poet who changed his life”. He wrote his first poems under the pseudonym of “Incertus” which means uncertain and “uncertain I was” he once said: “It was after reading Ted Hughs and Patrick Cavanagh that I thought that this material of my own from my county Derry is workable.” He moved from North to South in 1972 and that’s where he committed himself to poetry and allowed himself to be called a poet. “To me it’s a very large word ‘Poet’ and to think and allow yourself to be called poet is to consecrate yourself. I think it’s very serious,” he said in an interview. He was unapologetically Irish and despite his love for rural south Derry, boglands and “the north”, he spent much of his life in Dublin. Ironically, as he himself admitted, there is not a single poem inspired by the city of his residence. In 1983, he expressed his strong national identity in a fall-out with poets Andrew Motion and Blake Morrison who included him in The Penguin Book of Contemporary British Poetry. Heaney responded in An Open Letter, a 198-line poem: “Be advised, My passport’s green. No glass of ours was ever raised, To toast the Queen,” and then almost 30 years later, Heaney did in fact raise a glass to toast the Queen during her historic visit to Ireland in 2011. In 1968, his first collection of stories ‘Makhi’ was published which established him as an important story writer with a distinctive style of his own. Literary critics and readers still remember his title story ‘Makhi’ which was translated into many languages. Due to his unique style, he was bracketed with the likes of Enver Sajjad, Khalida Husain and Surinder Parkash. Noted storywriter Asad Muhammad Khan nostalgically remembers the days spent with him. “I had a long association with Hamesh Sahib, and in those days I was influenced by him and other architects of ‘New Story’. They were all my gurus and I learnt a lot from all of them. Hamesh’s magazine ‘Tashkeel’ stopped from being published due to lack of resources. The magazine was is in hibernation for more than five years. His daughter Injila Hamesh, who is also a poet, says he had to stop the publication of the magazine due to financial constraints. She is all praise for her father who fought with cancer and never gave up. “My father was writing his autobiography in his last days. I will try to get it published as it will be history of an era in which he lived,” she says. He also worked for NAPA and translated many famous Hindi plays into Urdu.